Tamsin: Have you ever been leading by a large amount and made an underplay that fortifies your position, often unnecessarily, with the intention of signalling to the opponent that further fighting is futile? I call such a play a Declaration of Victory, because it is a move that says "Do your worst, from now on I don't need to stretch myself anymore to win this game!" Of course, what happens most of the time when I make a declaration is that my opponent seems to get the bit between their teeth and start fighting hard. I weep inwardly when I recall all the promising positions I have thrown away in this manner. Where lies the difference between correct technique for reducing chances and wrapping up the victory, and making a premature declaration of victory? xela: Funny you should mention it. Just the other day I was looking at one of Shusaku's games in which he does something which, to my inexpert eye, looks very much like this. I'll post the position when I have more time. Yes, when I try this sort of thing in my own games I usually end up losing. Bob McGuigan: It's hard to know how slack you can be. If you are behind you press for every small advantage. If you are ahead there is a tendency to be too safe and lose too much bit by bit. Pros often "play safe" when ahead, but that means they don't take risks which might be necessary when behind. Moreover, pros are a lot better than we are at seeing what is needed to maintain a lead. Alex: From what I've seen, a professional "I win" move is more likely to be a large endgame move than a passive defensive move; I'm 10 points up, so I play a 15 point endgame move even though I still have some small weaknesses... that way, I have a 25 point territorial lead and can respond in the safest manner wherever you attack/invade. Increasing your lead enough that you can play safely everywhere thereafter is better than defending just one of your weaknesses completely, unless it's a weakness that lets your opponent can use to force you into a do-or-die fight. Bill: Small technical point. 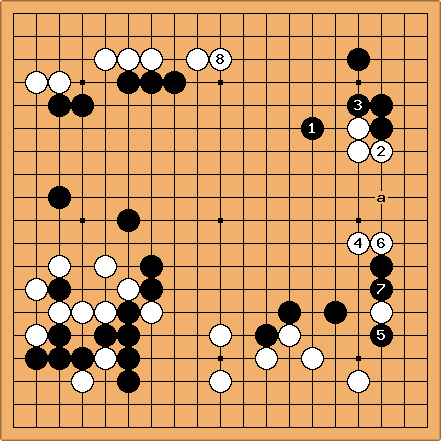 A move that gains 15 points is rare in the endgame. Lynx: 15 points raw, sure, but according to one type of analysis, moves as "small" as a 2cond line hane can be up to 12 points. Bill: Not to get off topic, but if you are talking about deiri counting, that does not tell you how much a move gains. This is game 3 of their 30-game match played in 1853. Of course there may be a lot happening here that I don't understand (when my copy of The Book arrives, I'll see if there is any commentary for this game), but it seems to me that after , white has a small territorial lead and no weak groups, and so --a solid move restraining black's expansion, but pure gote--is a declaration of victory. (Of course black can, and soon does, invade at 'a', but Shusaku has no trouble dealing with the invasion.) White won this game by 2 points (too small a margin for my comfort, but probably a clear victory for someone with Shusaku's excellent positional judgement) after 244 moves. Bill: looks huge to me. It is honte, restraining Black on the top and looking towards a possible erasure of Black's central framework. A kind of tedomari. Tamsin: I looked this up in Invincible. 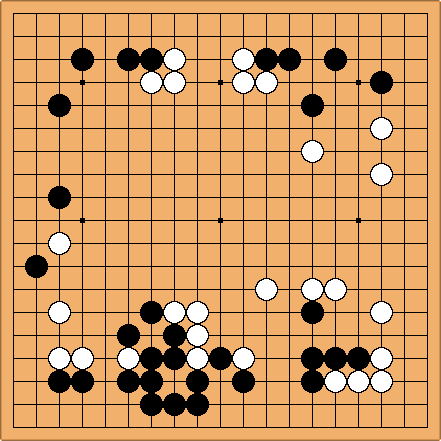 Go Seigen says that it prevents Black playing at the point one space to the right of (which of course would be an extension from his framework). Also, it gives White a super-solid base from which to erase any central plans Black may have, as Bill said. Therefore, it's not a declaration. Zarlan: No, no, no. A "declaration of victory" is, as far as I understood of what Tamsin originaly wrote, is a underplay that, although perhaps secureing your position, isn't at all made to secure your position at all. Rather it is made, just as a way of saying "look I've won, so resign already". Tamsin: Hi, yes, yes, yes! In fact it was I who wrote the "refined definition". Zarlan: lol! I should have double checked who it was that wrote it. Sorry about that. Bill: A word I feel is missing from this discussion is thick. When pros talk about game deciding plays they usually mean thick plays that reduce the opponent's possibilities. Often these plays solidify territory, even that of the opponent. Sometimes these plays may be less than theoretically optimal, but that is a minor consideration. As Bob McGuigan points out, making underplays because you think you are ahead can be a losing strategy. Bill: In response to Zarlan, let me say that I have never had the opponent take the hint. ;-) A coup de grace is more likely to elicit a resignation. Zarlan: Well no, they most probably won't. A coup de grace is a method I have used sometimes as well, but not necessarily with a big move. Rather with a move that makes certain kills obvious (and, of course, loses one point in gote). xela: I think we all more or less agree on what this means, but it's hard to be sure without looking at specific examples. The Shusaku position I posted isn't really that convicing, now that I understand it a bit better (thanks Tamsin and Bill for your comments), but I can't find anything better in my own recent games (I'm not often in the happy position of being able to declare victory!) Does anyone else have a clear example? Tamsin: I think I may have something better. 1 and 5 are the culprits. They might be called a declaration in the sense that White has decided to sit on his lead rather than continue fighting. And yet this was the point Cho started to come back into the game. Here, White should have descended to 5. Now, Black can turn at 6, which is very large, but this is still outweighed by the thinness of the top left. In other words, what was played was purely defensive, declaring that "what I have is enough", but this 5 would have continued fighting positively, seeking ways to get more instead of trying to sit back. Tamsin: Hi, thanks for this. I looked at this amusing example. It is not so much a declaration of victory as holding a Victory Parade on White's front lawn, LOL! Andreas Teckentrup: that move was looking very strange, but is actually remove some dangerous cutting aji. Its a rather famous move, ive seen it analyzed in a Japanese go book too. fractic: I can't find any way to cut at all. And even if there is such a way there surely has to be a more active way to defend against it.